Yesterday, the S&P 500 closed at 1,054, up 1.4% on the day. The S&P 500’s 2 day rally comes on accelerating volume and a TRADE line breakout - the S&P 500 is now bullish on TRADE and TREND. Relative to consensus, a surprise rate hike out of Australia put pressure on the dollar, which put a bid under commodities and commodity stocks. As Andrew Barber said yesterday “RBA Governor Glenn Stevens sent a clear message today by raising the benchmark rate by 25 basis points despite no evidence of inflationary pressure on the near horizon and stubbornly high unemployment.” Commodity equities were among the best performers yesterday with renewed momentum behind the REFLATION theme – The XLE and XLB were the two best performing sectors. Yesterday’s portfolio moves included selling our long positions in QGEN, AMGN and PSS. The dollar index fell 0.5% on the day and the VIX fell 4.2% and is now flat over the past week. Four of the nine sectors outperformed the S&P 500, with every sector positive for the second straight day. The three best performing sectors were Materials (XLB), Energy (XLE) and Technology (XLK), while Utilities (XLU), Healthcare (XLV) and Consumer Staples (XLP) were the bottom three. We are currently long the XLV. Yesterday, the XLK moved back to positive on both TRADE and TREND. The XLK benefited from the M&A tailwind as EMR agreed to acquire AVCT for $1.2B in cash. In addition, Semis were another bright spot with the SOX +2.1%. 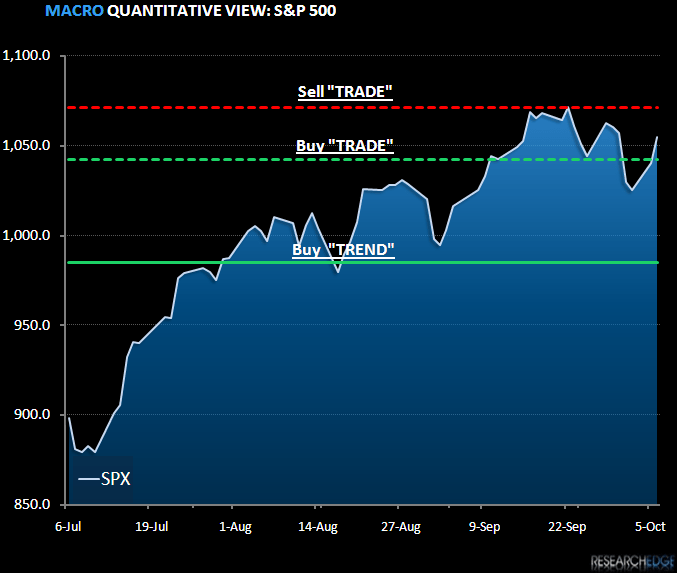 Today, the set up for the S&P 500 is: TRADE (1,042) and TREND is positive (985). The Research Edge quantitative models have 9 of 9 sectors in the S&P500 positive on TREND and 7 of 9 sectors are positive from the TRADE duration. Yesterday, the XLI, XLK and the XLB moved back to being BULLISH on the TRADE duration. Right now the Research Edge models suggest that there is 1% downside and 1.5% upside in the S&P 500. At the time of writing the futures pointed to a higher open.